Home > News > Event Recap: Mikhail Fridman, What does it take to become an entrepreneur? 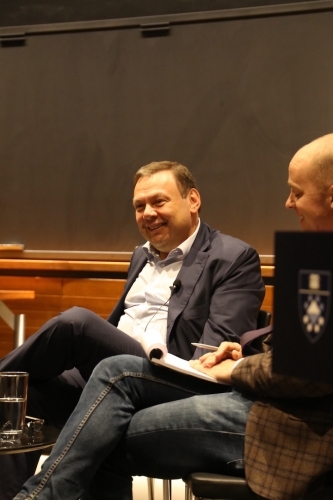 Event Recap: Mikhail Fridman, What does it take to become an entrepreneur? L1 has an estimated $23 billion under management and buys and builds investments internationally – in the energy, telecoms and technology, health, and retail sectors. L1 is also a passive investor in private equity funds. It most recently bought the UK retail chain Holland & Barrett from The Nature’s Bounty Co. and The Carlyle Group for £1.77 Billion. Mr. Fridman opened his talk by emphasizing that “to become a successful businessperson, the same features are needed as to succeed in any other domain in life – it is essential to be smart, well educated, and both persistent and flexible.” Drawing upon his experiences with starting up businesses, he stressed that entrepreneurship relies on the skillful combining of an analytical approach with creativity, and that the key to successful endeavors is the understanding of human beings’ behavior and needs. Despite what Mr. Fridman called “a lack of tradition of doing business” in the late Soviet Union and early Russia, he managed to grow his business activity from trading computers, photocopiers and foreign consumer goods such as perfumes and rugs, to starting up a retail bank that would provide him with working capital, to getting involved in the energy business in order to secure foreign currency needed for trading. An active philanthropist, Mr. Fridman, who holds both Israeli and Russian passports, believes spending money purposefully can prove harder than making it in the first place. He is an active supporter of Jewish initiatives worldwide – including co-founding the Genesis Prize, which is awarded annually in Jerusalem. He also co-founded the Genesis Philanthropy Group, which develops and enhances a sense of Jewish identity among Russian-speaking Jews worldwide. “It is easy to get very apt people for a business project, not always so for a charity. The latter requires huge and genuine engagement, personal investment and passion, while in business it is simply money incentives that matter.” Drawing on his experiences, Mr. Fridman also believes there is a need for better ways to measure welfare or the potential for innovation in a 21st century economy because GDP fails to describe and measure the human capital of a country. Written by Weronika Betta, Yale College Class of 2020, Ezra Stiles College.